Before we even signed the contract we knew the first thing we would have to redo would be the wood floors. The lady we bought the house from is highly allergic to the polyurethane used to seal hardwood floors and can’t be around a floor that has been refinished for several weeks after the work is done. Because of this, floors in our house haven’t been refinished in more than 20 years. 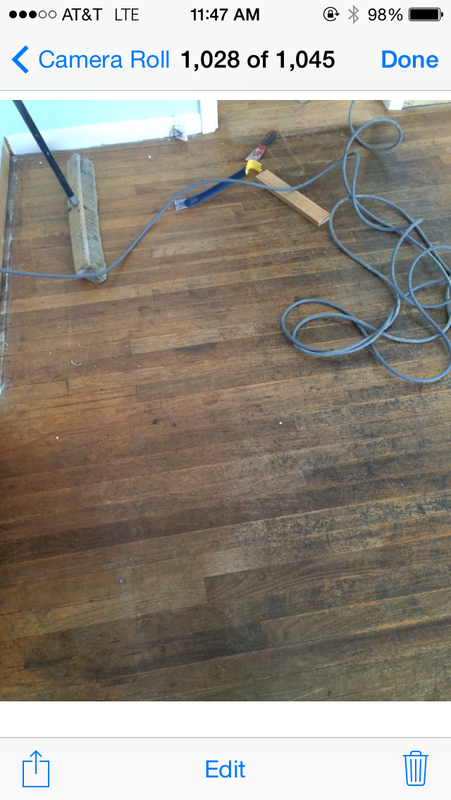 Over time as the sealant wore off, the floors became more and more damaged. Add in the lack of care they received and you get something like what you see below. Fortunately, the seller included $2,000 to have the floors refinished as part of the contract because she was unable to have it done herself. After some research we decided that rather than pay someone else to do the floors, we would do it ourselves, and then use the leftover money to make further improvements like getting new moulding. We had heard that refinishing floors is quite a precise science and difficult to do well, but after talking to my uncle who had done it several times successfully, we decided to give it a go anyway. The front room was a high traffic area and the floor started to turn a greyish black color where it was most heavily used. The second bedroom was a disaster. There were large, deep scrapes covering floor where furniture had been dragged around, paint was splattered everywhere, and right in the middle of the room was a huge dark puddle where hair dye had been spilt. It was a mess. Our original plan was to also pull up the vinyl tiles in the kitchen and redo the wood floors in there at the same time, but before we closed we learned some unfortunate history from the seller. Beneath the vinyl tiles is a layer of orange and green linoleum that had been glued down to the wood sometime during the 70s. 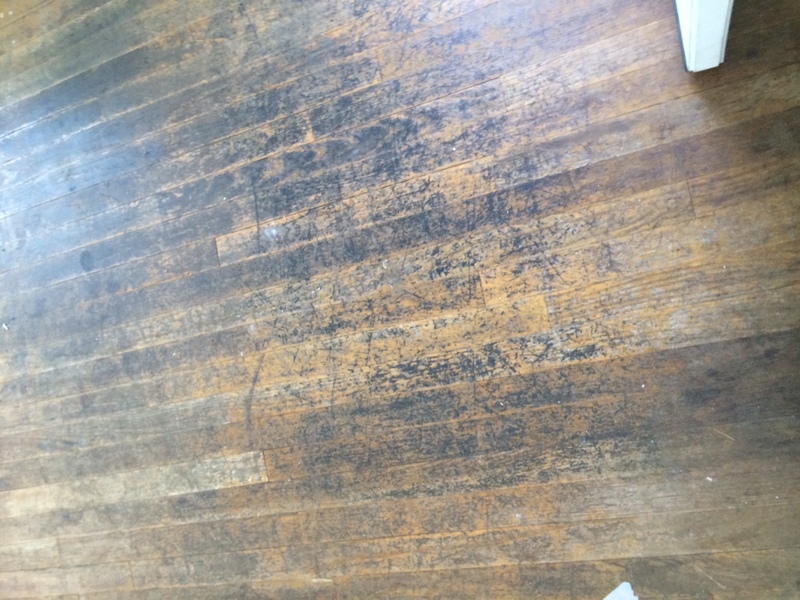 A previous owner had tried to get it off, failed, then tried to cover the remaining bits that wouldn’t come off with a newer beige linoleum, but it wouldn’t stick correctly because the partially torn off flooring was flaking and creating bumps. So, they decided to take about a hundred screws and screw the bumpy bits down before covering it with more beige linoleum. This was quite sad news. 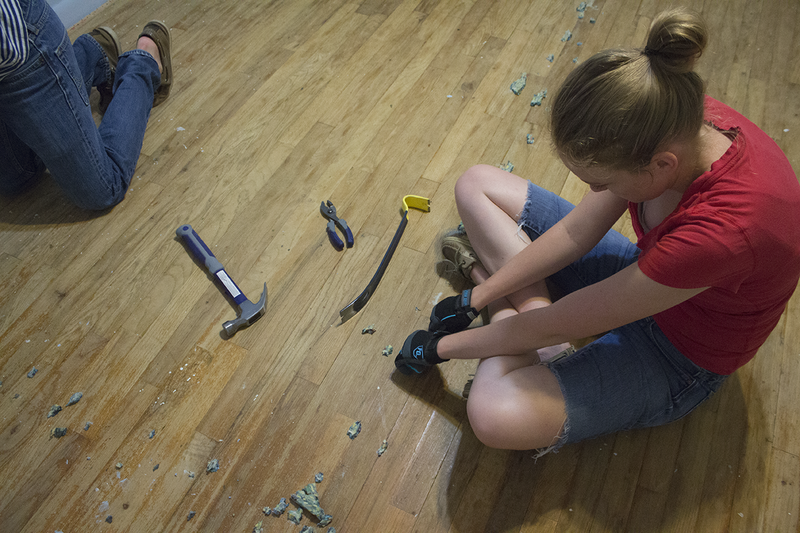 I was sure that with enough elbow grease we could get the old linoleum and glue off, but that many screw holes drilled into the floor presented quite a problem. 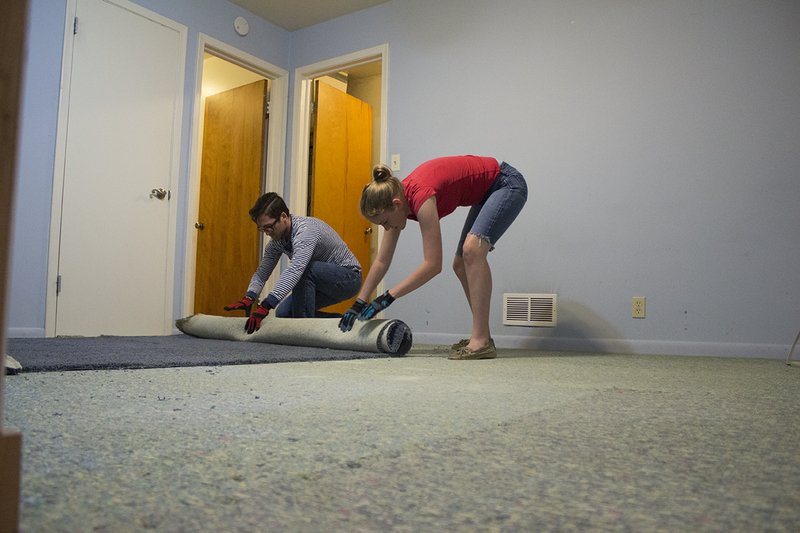 We were worried that after pulling up all the coverings we would find a floor that was so damaged it had to be replaced, which, was not something we were prepared to do. So for now we are leaving the floor as it is and will wait until we re-do the entire kitchen to tackle that project. The larger of the two bedrooms was covered in carpet and the very first night we got the keys to our house we went over and ripped it out. Aaron cleaned carpets for several summers during high school which gave him an honest look at what carpet really is—disgusting. If someone else has lived with it, or an animal has lived with it, it’s just plain gross. This carpet met both of those criteria and we wanted it out. The blue shag had protected the floor from scratches, and though the wood had almost no finish left it was in quite good shape. 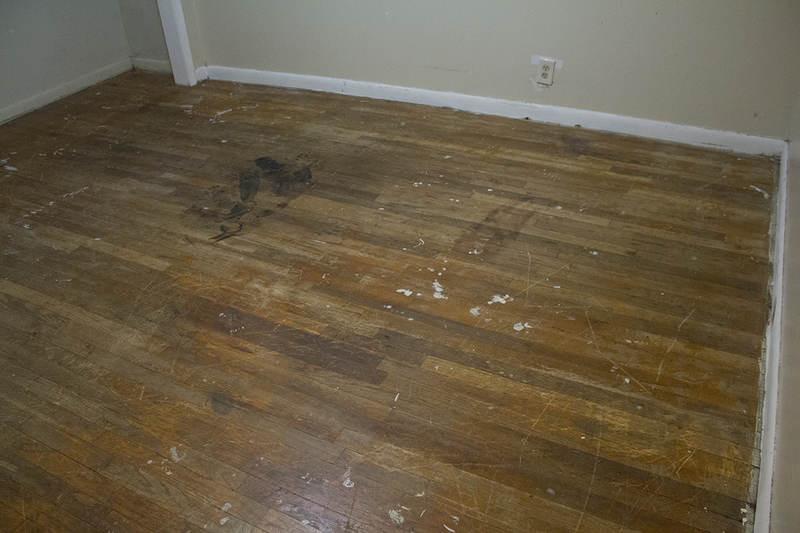 We did find a collection of paint splatters, though not as bad as in the other bedroom, but the most troubling thing were all of the staples that had been used to keep the carpet padding down. 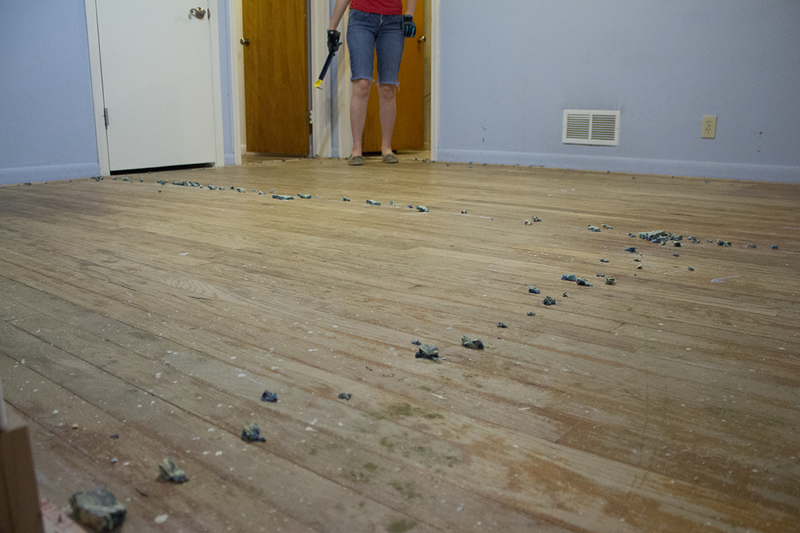 After removing the carpet we were left with bits of carpet pad clinging to heavy duty staples in the floor. We spent the rest of the evening pulling these staples out one by one with pliers and removing the tack strips from around the edges of the room. 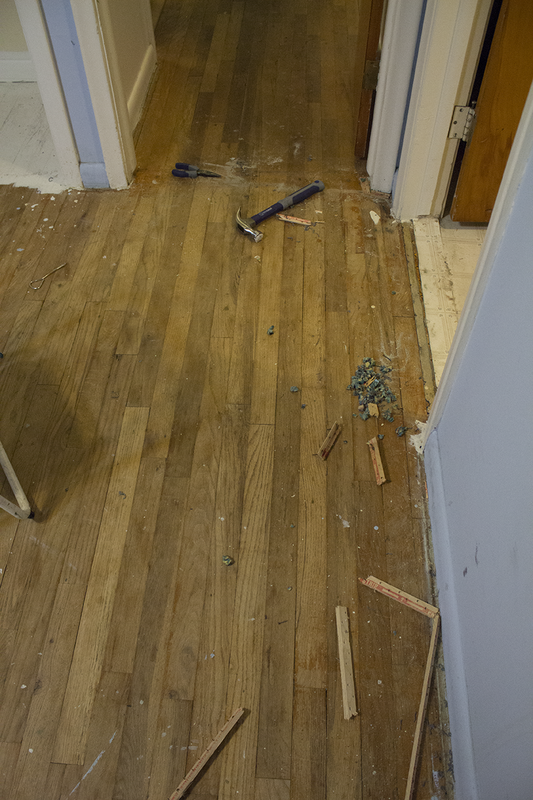 After removing every trace of the carpet we turned our attention to the baseboards. Aaron used a crowbar and a putty knife and pried them off piece by piece. 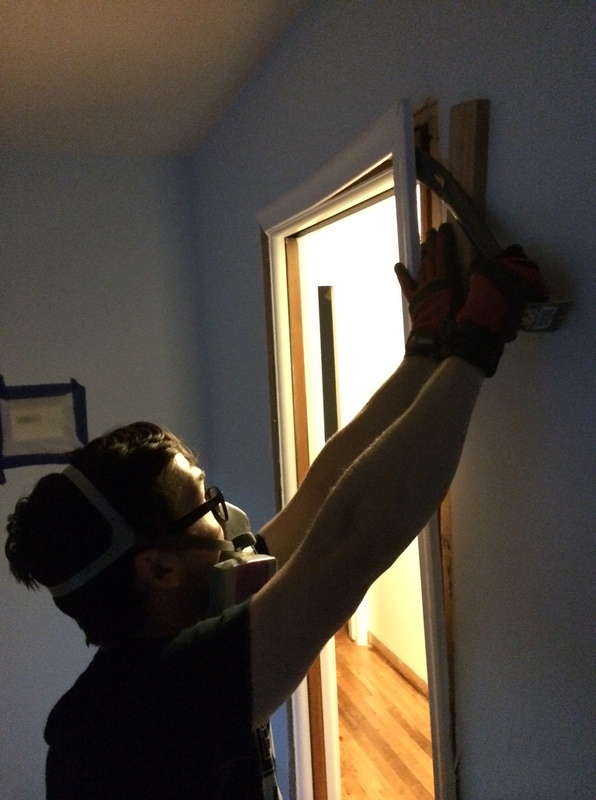 We had tested for lead paint and found what we thought might be a trace of it, so we decided to be safe and wear lead paint masks while doing this step. 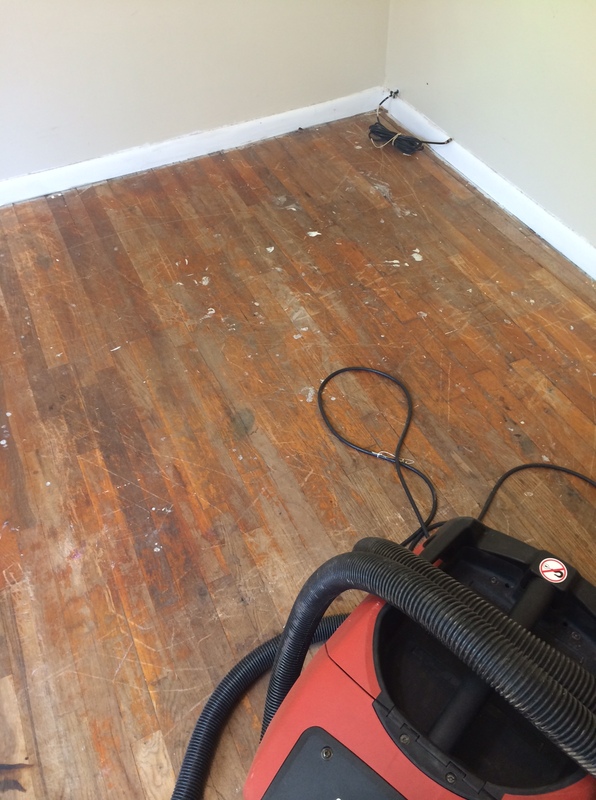 We wanted to replace the baseboards and door trim with something a little wider and a bit more modern looking anyway, but we also needed to remove it to better sand the floors down. When the baseboards had last been painted it looked as though the floors had not been taped off, because all the way around the room there was a line of paint just in front of where the baseboards had been. This will require quite a bit of hand sanding later. 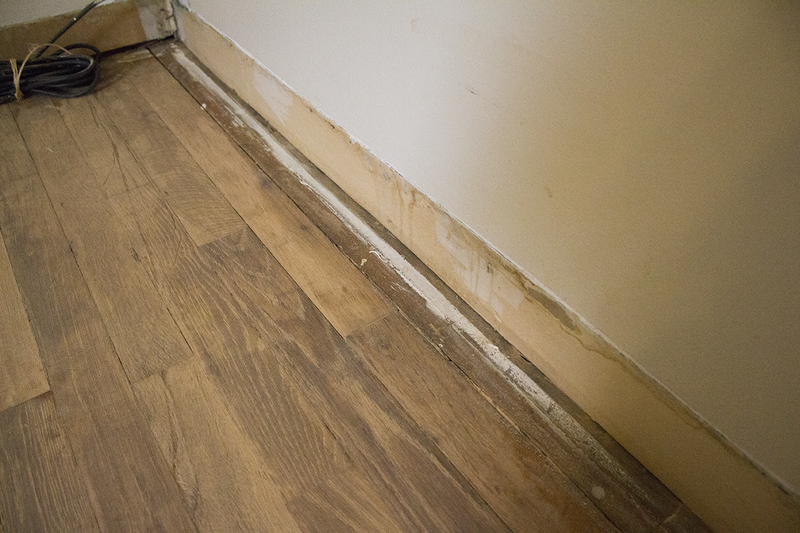 The baseboard removed, and the line of paint on the floors from a lack of painters tape.